The stars were out in March at the 2017 Hasbro Children’s Hospital Heroes Ball, where Phyllis Dennery, MD , the Sylvia Kay Hassenfeld Chair of Pediatrics and pediatrician-in-chief at Rhode Island Hospital (left), and François Luks, MD , professor of surgery and interim chief of the Division of Pediatric Surgery, picked up their instruments and joined the band. This is the third time Luks has performed at the ball since 2014; prior to that, he hadn’t played since his own wedding. 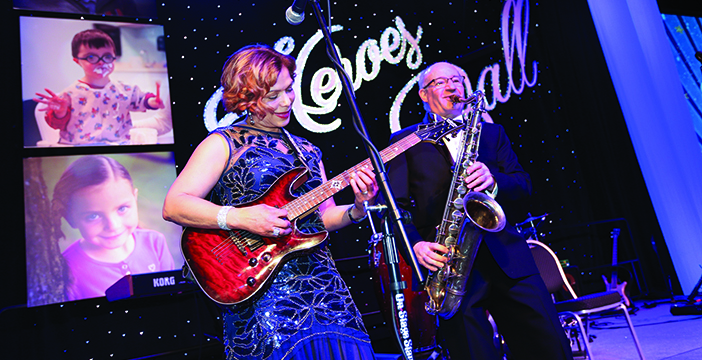 “In other words,” he says, “I only play saxophone in a tux.” It’s all for a great cause: the Heroes Ball raised nearly $1 million for the hospital.